This selection of worksheets are diligently researched and comprise various exercises to help students grasp the concept of division. Activities displayed here include topics like draw hops and divide, find the missing numbers, write division sentences, MCQs and much more! Most topics have been segregated into two types. A number of free printable worksheets are also available for practice. To find the quotient, draw the hops in reverse using the dividend as the starting point. The divisor is represented by the interval of hops on the number line. The number of hops drawn is the quotient. 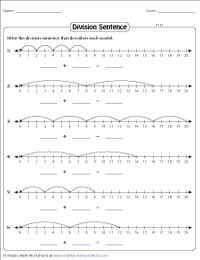 Read each number line to complete the division sentences. 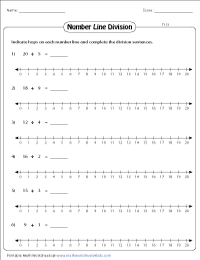 Fill in the missing values (divisor, dividend or quotient) in this batch of worksheets. Use the Type 1 and Type 2 worksheets for a unique insight! Observe the number of hops, interval of hops and the starting point on each number line keenly. Write the apt division sentences that match them. Look up the answer key to check your responses. 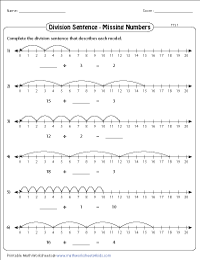 Pick out the correct division equation that best matches the number lines provided in this ensemble of worksheets. 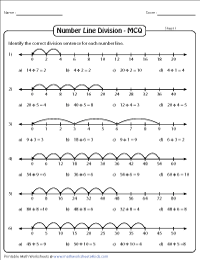 The number lines featured here include increments in multiples of whole numbers up to 10. 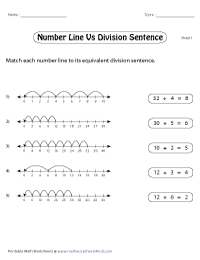 Match the number line on the left to the equivalent division sentence on the right. Each sheet has 5 problems.